This is a flavorful one pot meal made with red kidney beans using pressure cooker. This vegan and gluten free pulao is easy to make and is ready in less than 30 minutes (cooking time). 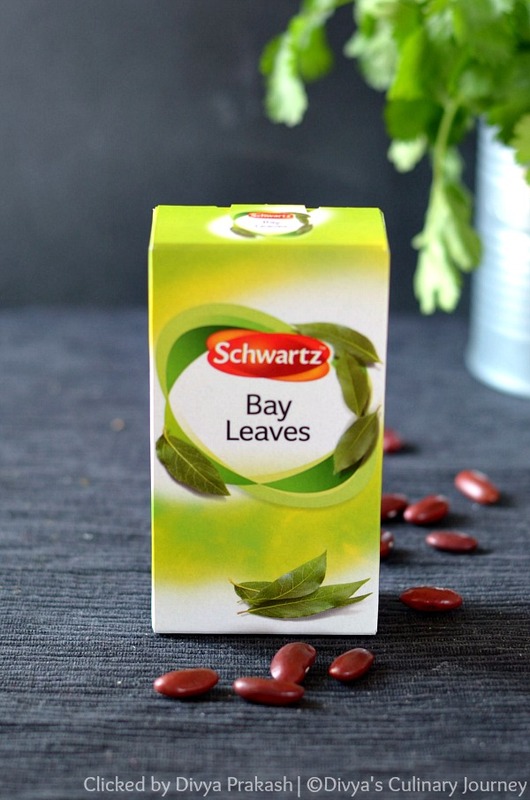 Bay leaves from Schwartz : 2 nos. Soak dried red kidney beans for atleast 4 - 6 hours. Overnight soaking is preferable, so plan accordingly. Do the required preparations for the pulao- Slice onions, slit green chillies, grate ginger, mince garlic , clean-wash-chop mint leaves and cilantro leaves and finally, wash basmati rice, drain excess water and set it aside. Heat oil in a pressure cooker and add fennel seeds, cloves, cinnamon and bay leaves and fry for a minute. Then add onions, green chillies and fry till onions turn translucent. Now add the grated ginger, minced garlic along with chopped mint leaves and cook for another minute. Then add turmeric powder, chilli powder and garam masala powder and mix well. 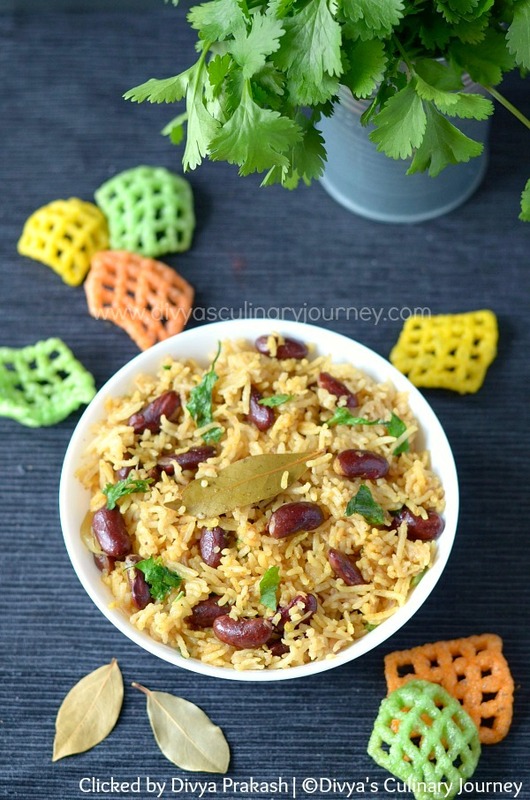 Drain the soaked rajma(red kidney beans) and add it, mix well and then add the washed basmati rice. Now add coconut milk and required water along with salt as per taste and mix well. Cover the lid and pressure cook it for one whistle in medium-high heat and then turn it off. Wait till the pressure releases. Then gently fluff up the rice and garnish with cilantro and serve it warm. I used 1/2 cup dried red kidney beans and after soaking it was about 1 cup. So if you are using canned red kidney bean, use 1 cup of it. Adjust green chillies and chilli powder as per your heat tolerance level. This can be prepared in electric rice cooker too. The dried red kidney beans has to be soaked for at least 4 - 6 hours. I have used basmati rice. You can use other variety of rice too. Based on the variety of rice used water quantity will vary. This post is written in collaboration with Schwartz but the content and opinions expressed here are my own. 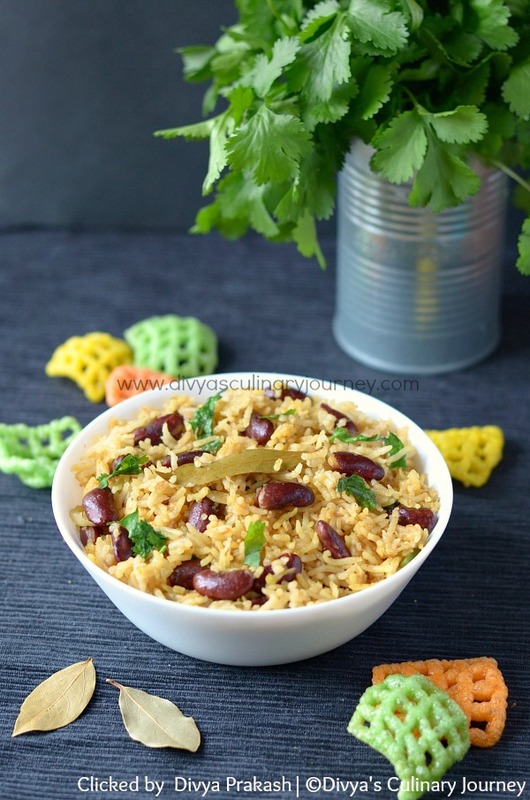 Delicious and healthy rajma pulao. Interesting Pulav recipe, looks delicious! I love the combination of spices you used in this dish as well as how easy it looks to make! Such a great use of kidney beans, outside of chili; love this one! What a pretty dish. And it's using my favorite legume. I love kidney beans. I usually use canned. I need to make this dish! The kidney beans look perfect with the basmati rice. I bet I'll love those seasonings too! I love a quick meal and if it so delicious as this one then it is double win! This sounds wonderful. I can't wait to try it. All of your recipes and so wonderful! I'm very impressed with the flavors and colors in this one. It looks so yummy! Your recipe sounds wonderful, and it looks so good. I like that those bay leaves are in a box, mine are in a bag and end up crushed!! 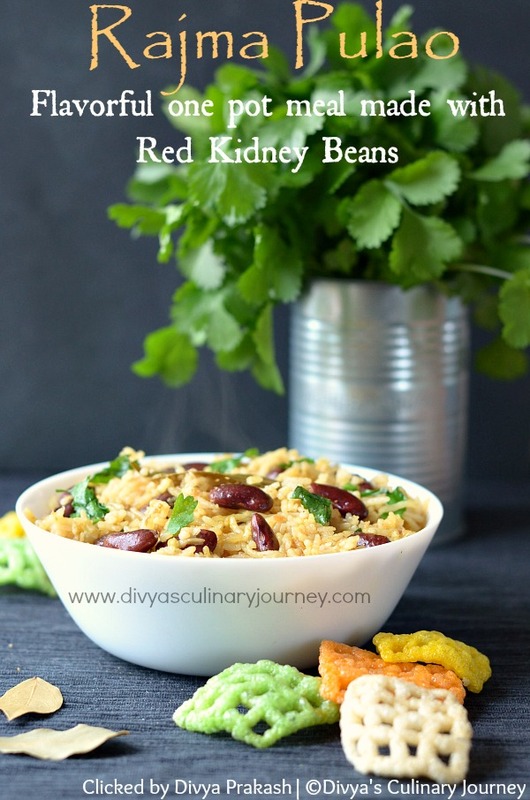 Your dish looks fantastic and we love red kidney beans here! This looks like a fabulous recipe for me to try.